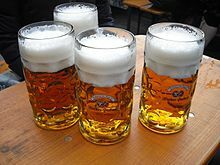 On October 12, 1810, the Royal Family of Bavaria, in what is now Germany, for the occasion of the celebration of the marriage of Crown Prince Ludwig of Bavaria to Princess Therese von Sachsen-Hildburghausen, invited all the citizens of Munich to join in the first ever Oktoberfest, a tradition that has become the largest “volksfest” in the world. Lasting from 16 to 18 days, the main attraction is the wonderful beer that Bavaria is known for, but of course there is also music, dancing, and other folk-type activities, similar to American annual county fairs. As mentioned earlier, many cities around the world also celebrate Oktoberfest, especially cities with sizable German populations. Believe it or not, the largest (varies from year to year) Oktoberfest outside of Germany is in Kitchener, Ontario with about 700,000 attendees. The (normally) largest Oktoberfest in the United States is in Cincinnati, Ohio with around a half million revelers. The popularity of having an Oktoberfest celebration has continued to grow, with new Oktoberfests springing up in cities all over, notably in Montreal, Quebec, Canada since 2007. Other large North American Oktoberfest galas are held in Denver and New York City. Much of the population of the state of Pennsylvania can trace their roots to Germany or Austria, and predictably Pennsylvania is a veritable hotbed of Oktoberfest celebrations. Most major American cities with large German populations also boast German cuisine restaurants, and these places usually have some sort of Oktoberfest themed specials in September and October. Märzen served at Oktoberfest in the traditional 1-litre Maß. To enjoy Oktoberfest, you: A. Do not have to be German; B. Do not have to drink beer. What you do have to do is enjoy oompah and polka music, lederhosen, buxom frauleins serving brewskis in traditional Bavarian outfits, and good food, especially German food such as bratwurst, sauerbraten, and wiener schnitzel. It is also recommended that you bring an appetite for all sorts of pastries and other goodies that are likely to be there. Even though you do not have to be German to enjoy Oktoberfest, it is not a bad idea to search your roots for any scintilla of evidence of German ancestry to give yourself a sort of legitimacy to enjoy Oktoberfest like a native of Munich. (The author is 1/8th German, plenty of reason to enjoy Oktoberfest!) Just in case there maybe, just maybe, be a little German heritage in your DNA, get yourself a “Kiss Me I’m German” button to wear at Oktoberfest so you blend in with the crowd. (We pull the same trick on Saint Patrick’s Day…). 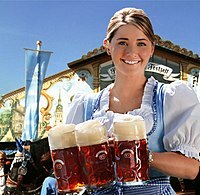 A waitress with Hacker-Pschorr, one of the traditional beers allowed to be served at Oktoberfest. She wears a dirndl, a traditional women’s dress of Bavaria. Games, music, crafts, beer, schnapps, food and general bon homie (or whatever the German equivalent is) makes for a good time when summer is becoming a memory. Just be sure to save some money and appetite for Pumpkinfest! Questions for Students (and others): Have you attended an Oktoberfest? Does your family make Oktoberfest a regular celebration? Does your city or county have an annual Oktoberfest? If you drink beer, what is your favorite Oktoberfest brew? Did you ever hear of the origin of Oktoberfest before? Kummerrow, Marion. The Ultimate Guide to Oktoberfest: Munich Germany Travel Guide. CreateSpace, 2012. Lachs, Jennifer. Oktoberfest on a Budget: More Beer for your Buck. Amazon Digital, 2015. Wolff, Moses. Meet Me in Munich: A Beer Lover’s Guide to Oktoberfest. Skyhorse Publishing, 2013. The featured image in this article, Das Pferderennen auf dem Münchner Oktoberfest (A Horse Race at the Oktoberfest in Munich), circa 1823, by Heinrich Adam (1787–1862) from http://www.evangelisch.de/themen/galerie/23205, is a faithful photographic reproduction of a two-dimensional, public domain work of art. The work of art itself is in the public domain for the following reason: this work is in the public domain in its country of origin and other countries and areas where the copyright term is the author’s life plus 100 years or less. Previous ArticleOctober 11, 2018: Every Day Should Be National Sausage Pizza Day!